The world, according to one widely debunked theory, is slated to end on Dec. 21. Around the world the paranoid are readying themselves for Doomsday, a date they believe is predicted in an ancient Mayan prophesy. There's just one problem: no one seems to know at just what time we're all supposed to meet our fiery end. ABC News is checking in around the world, as the clock turns to midnight on Dec. 21, to find out if the world has ended - so far, so good. Mexico City, Mexico (midnight 1:00 a.m. ET; GMT -6): "Everything is very normal," said Andrea, an employee at the JW Marriott. Andrea, who declined to give her last name, said the hotel guests are all safe and sound. The world there has not ended. New York, U.S. (midnight; 12:00 a.m. ET; GMT -5): From the ABC News newsroom in New York City, we can confirm the world here has not ended. London, U.K. (midnight; 7 p.m. ET; GMT +0): ABC News' Jeffrey Kofman reports: It did feel a bit like the end of the world here in London today. The rain was so heavy, the clouds so dark, the winter chill so penetrating that had Noah's Ark sailed past I might have hitched a ride. But all this has more to do with the time of the year than all the hyperventilating about the Mayan calendar. … Fear not, North America. There is no need to rush to your doomsday bunkers. On this side of the Atlantic, the world is still turning. 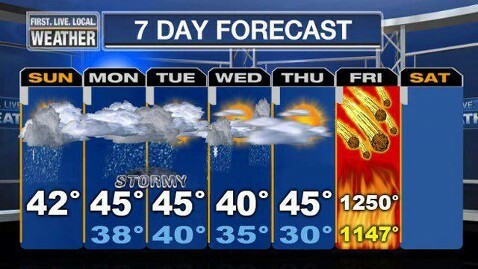 By the time the Mayan calendar runs out where you are, it looks you'll be OK, too. Bugarach, France (midnight; 6:00 p.m. ET; GMT +1): "Apocalypse? Non!" said an exasperated resident of this tiny French mountain town in the Pyrenees. Foreign journalists alone doubled the population of the town rumored to be one of the few places that would have been spared annihilation had the world ended. The world there has not ended. 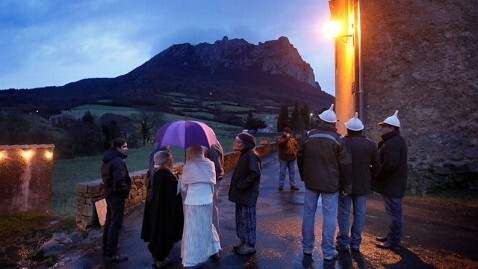 People gather at dusk in Bugarach, France a small village in the foothills of the Pyrenees. The mountain town is rumored to be a place of protection should Doomsday come. Moscow, Russia (2:00 a.m; 5:00 p.m. ET; GMT +4) UPDATE: ABC's Kirit Radia reports: "revelers are celebrating at a luxury "End of the World Party" in an underground Soviet bunker in Moscow for a chance to dance into the apocalypse. So far it looks like they'll wake up on Friday, albeit perhaps with at hangover that feels like brimstone and fire. But all is not lost. Organizers plan to give everyone a 50 percent refund if the Mayans got it wrong." The world there still has not ended. Moscow, Russia (midnight; 3:00 p.m. ET; GMT +4): "Everything in Russia is O.K. Maybe some people were worried, but nobody seems worried anymore," said Nikolai Yeriomin at the Sheraton Palace Hotel. A recent survey found that 9 percent of Russians believed the world would end on Dec. 21, prompting President Vladimir Putin to calm his people's nerves and tell them they would be fine for another 4.5 billion years. The world there has not ended. Calcutta, India (midnight; 1:30 p.m. ET; GMT +5:30): "We are all all right. Thank you for asking," said Sister Mary of Mother Teresa's Missionaries of Charity. The world there has not ended. Phuket, Thailand (midnight; 12 p.m. ET; GMT + 7): "Everything is normal. The hotel is open and people are having a good time," reported a laughing Lek Kalymunag, from the Hilton Phuket Resort and Spa. The world there has not ended. SOCIAL: What Does the End of the World Look Like in Your Neck of the Woods? Shanghai, China (midnight; 11 a.m. ET; GMT +8): "Everything is OK. Yes. No, problems," said a still living customer service operator at the Bank of Shanghai. The world there has not ended. Tokyo, Japan (midnight; 10 a.m. ET; GMT +9): "Yes, people are playing ping-pong," said a man identifying himself as Hiyashi at Lesiure Land Pallette Town, a 24-hour video arcade and bowling alley. The world there has not ended. Sydney, Australia (midnight; 9 a. m. ET; GMT +10): "We're still kicking, we're still throwing beers," Ellie Spicer, a manager at 3 Wise Monkeys Pub tells ABC News. The world there has not ended. Auckland, New Zealand (midnight; 7 a.m. ET; GMT +12): The world there has not ended.